This article is about the trade group from the 14th to 17th centuries. For the modern business association, see Hanseatic Parliament. For the intra-EU political group, see New Hanseatic League. 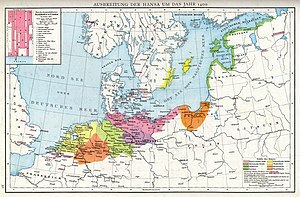 The Hanseatic League (/ˌhænsiˈætɪk/; Middle Low German: Hanse, Düdesche Hanse, Hansa; Standard German: Deutsche Hanse; Latin: Hansa Teutonica) was a commercial and defensive confederation of merchant guilds and market towns in Northwestern and Central Europe. Growing from a few North German towns in the late 1100s, the league came to dominate Baltic maritime trade for three centuries along the coasts of Northern Europe. Hansa territories stretched from the Baltic to the North Sea and inland during the Late Middle Ages, and diminished slowly after 1450. Hanse, later spelled as Hansa, was the Old High German word for a convoy, and this word was applied to bands of merchants traveling between the Hanseatic cities - whether by land or by sea. Merchant circles established the league to protect the guilds' economic interests and diplomatic privileges in their affiliated cities and countries, as well as along the trade routes which the merchants used. The Hanseatic cities had their own legal system and operated their own armies for mutual protection and aid. Despite this, the organization was not a state, nor could it be called a confederation of city-states; only a very small number of the cities within the league enjoyed autonomy and liberties comparable to those of a free imperial city. 5.1 "City League The Hanse"
Historians generally trace the origins of the Hanseatic League to the rebuilding of the north German town of Lübeck in 1159 by the powerful Henry the Lion, Duke of Saxony and Bavaria, after he had captured the area from Adolf II, Count of Schauenburg and Holstein. Exploratory trading adventures, raids, and piracy had occurred earlier throughout the Baltic region—the sailors of Gotland sailed up rivers as far away as Novgorod, for example—but the scale of international trade in the Baltic area remained insignificant before the growth of the Hanseatic League. Visby functioned as the leading centre in the Baltic before the Hansa. 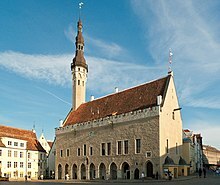 Sailing east, Visby merchants established a trading post at Novgorod called Gutagard (also known as Gotenhof) in 1080. Merchants from northern Germany also stayed in the early period of the Gotlander settlement. Later they established their own trading station in Novgorod, known as Peterhof [de; ru], which was further up river, in the first half of the 13th century. In 1229, German merchants at Novgorod were granted certain privileges that made their positions more secure. Hansa societies worked to remove restrictions to trade for their members. Before the official foundation of the league in 1356, the word Hanse did not occur in the Baltic language. Gotlanders used the word varjag. The earliest remaining documentary mention, although without a name, of a specific German commercial federation is from London in 1157. That year, the merchants of the Hansa in Cologne convinced Henry II, King of England, to free them from all tolls in London and allow them to trade at fairs throughout England. The "Queen of the Hansa", Lübeck, where traders were required to trans-ship goods between the North Sea and the Baltic, gained imperial privileges to become a free imperial city in 1226, as its potential trading partner Hamburg had in 1189. In 1241, Lübeck, which had access to the Baltic and North seas' fishing grounds, formed an alliance—a precursor to the league—with Hamburg, another trading city, that controlled access to salt-trade routes from Lüneburg. The allied cities gained control over most of the salt-fish trade, especially the Scania Market; Cologne joined them in the Diet of 1260. In 1266, Henry III of England granted the Lübeck and Hamburg Hansa a charter for operations in England, and the Cologne Hansa joined them in 1282 to form the most powerful Hanseatic colony in London. Much of the drive for this co-operation came from the fragmented nature of existing territorial governments, which failed to provide security for trade. Over the next 50 years the Hansa itself emerged with formal agreements for confederation and co-operation covering the west and east trade routes. The principal city and linchpin remained Lübeck; with the first general diet of the Hansa held there in 1356, the Hanseatic League acquired an official structure. Lübeck's location on the Baltic provided access for trade with Scandinavia and Kievan Rus' with its sea trade center Veliky Novgorod, putting it in direct competition with the Scandinavians who had previously controlled most of the Baltic trade routes. A treaty with the Visby Hansa put an end to this competition: through this treaty the Lübeck merchants gained access to the inland Russian port of Novgorod, where they built a trading post or Kontor (literally: "office"). Although such alliances formed throughout the Holy Roman Empire, the league never became a closely managed formal organisation. Assemblies of the Hanseatic towns met irregularly in Lübeck for a Hansetag (Hanseatic diet), from 1356 onwards, but many towns chose not to attend nor to send representatives and decisions were not binding on individual cities. Over the period, a network of alliances grew to include a flexible roster of 70 to 170 cities. Starting with trade in coarse woollen fabrics, the Hanseatic League had the effect of bringing both commerce and industry to northern Germany. As trade increased, newer and finer woollen and linen fabrics, and even silks, were manufactured in northern Germany. The same refinement of products out of cottage industry occurred in other fields, e.g. etching, wood carving, armour production, engraving of metals, and wood-turning. The century-long monopolization of sea navigation and trade by the Hanseatic League ensured that the Renaissance arrived in northern Germany long before the rest of Europe. The league had a fluid structure, but its members shared some characteristics; most of the Hansa cities either started as independent cities or gained independence through the collective bargaining power of the league, though such independence remained limited. The Hanseatic free cities owed allegiance directly to the Holy Roman Emperor, without any intermediate family tie of obligation to the local nobility. Another similarity involved the cities' strategic locations along trade routes. At the height of its power in the late 14th century, the merchants of the Hanseatic League succeeded in using their economic clout, and sometimes their military might—trade routes required protection and the league's ships sailed well-armed—to influence imperial policy. The league also wielded power abroad. Between 1361 and 1370, it waged war against Denmark. Initially unsuccessful, Hanseatic towns in 1368 allied in the Confederation of Cologne, sacked Copenhagen and Helsingborg, and forced Valdemar IV, King of Denmark, and his son-in-law Haakon VI, King of Norway, to grant the league 15% of the profits from Danish trade in the subsequent peace treaty of Stralsund in 1370, thus gaining an effective trade and economic monopoly in Scandinavia. This favourable treaty marked the height of Hanseatic power. After the Danish-Hanseatic War (1426–1435) and the Bombardment of Copenhagen (1428), the commercial privileges were renewed in the Treaty of Vordingborg in 1435. The Hansa also waged a vigorous campaign against pirates. Between 1392 and 1440, maritime trade of the league faced danger from raids of the Victual Brothers and their descendants, privateers hired in 1392 by Albert of Mecklenburg, King of Sweden, against Margaret I, Queen of Denmark. In the Dutch–Hanseatic War (1438–41), the merchants of Amsterdam sought and eventually won free access to the Baltic and broke the Hanseatic monopoly. As an essential part of protecting their investment in the ships and their cargoes, the League trained pilots and erected lighthouses. Most foreign cities confined the Hanseatic traders to certain trading areas and to their own trading posts. They seldom interacted with the local inhabitants, except when doing business. Many locals, merchant and noble alike, envied the power of the league and tried to diminish it. For example, in London, the local merchants exerted continuing pressure for the revocation of privileges. The refusal of the Hansa to offer reciprocal arrangements to their English counterparts exacerbated the tension. King Edward IV of England reconfirmed the league's privileges in the Treaty of Utrecht (1474) despite the latent hostility, in part thanks to the significant financial contribution the league made to the Yorkist side during the Wars of the Roses. In 1597, Queen Elizabeth I of England expelled the league from London, and the Steelyard closed the following year. Ivan III of Russia closed the Hanseatic Kontor at Novgorod in 1494. The very existence of the league and its privileges and monopolies created economic and social tensions that often crept over into rivalries between league members. The economic crises of the late 15th century did not spare the Hansa. Nevertheless, its eventual rivals emerged in the form of the territorial states, whether new or revived, and not just in the west: Poland triumphed over the Teutonic Knights in 1466; Ivan III, Grand Prince of Moscow, ended the entrepreneurial independence of Hansa's Novgorod Kontor in 1478—it closed completely and finally in 1494. 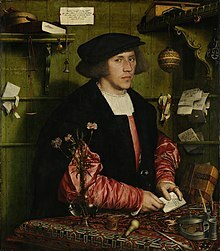 New vehicles of credit were imported from Italy, where double-entry book-keeping was invented in 1492, and outpaced the Hansa economy, in which silver coins changed hands rather than bills of exchange. In the 15th century, tensions between the Prussian region and the "Wendish" cities (Lübeck and its eastern neighbours) increased. Lübeck was dependent on its role as centre of the Hansa, being on the shore of the sea without a major river. It was on the entrance of the land route to Hamburg, but this land route could be bypassed by sea travel around Denmark and through the Kattegat. Prussia's main interest, on the other hand, was the export of bulk products like grain and timber, which were very important for England, the Low Countries, and, later on, also for Spain and Italy. In 1454, the year of the marriage of Elisabeth of Austria to the Jagiellonian king, the towns of the Prussian Confederation rose up against the dominance of the Teutonic Order and asked Casimir IV, King of Poland, for help. 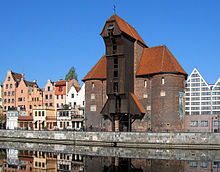 Gdańsk (Danzig), Thorn and Elbing became part of the Kingdom of Poland, (from 1466–1569 referred to as Royal Prussia, region of Poland) by the Second Peace of Thorn (1466). Poland in turn was heavily supported by the Holy Roman Empire through family connections and by military assistance under the Habsburgs. Kraków, then the capital of Poland, had a loose association with the Hansa. The lack of customs borders on the River Vistula after 1466 helped to gradually increase Polish grain exports, transported to the sea down the Vistula, from 10,000 short tons (9,100 t) per year, in the late 15th century, to over 200,000 short tons (180,000 t) in the 17th century. 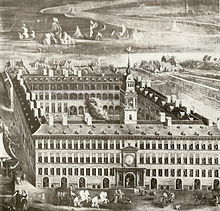 The Hansa-dominated maritime grain trade made Poland one of the main areas of its activity, helping Danzig to become the Hansa's largest city. A major economic advantage for the Hansa was its control of the shipbuilding market, mainly in Lübeck and in Danzig. The Hansa sold ships everywhere in Europe, including Italy. They drove out the Dutch, because Holland wanted to favour Bruges as a huge staple market at the end of a trade route. When the Dutch started to become competitors of the Hansa in shipbuilding, the Hansa tried to stop the flow of shipbuilding technology from Hanseatic towns to Holland. Danzig, a trading partner of Amsterdam, attempted to forestall the decision. Dutch ships sailed to Danzig to take grain from the city directly, to the dismay of Lübeck. Hollanders also circumvented the Hanseatic towns by trading directly with north German princes in non-Hanseatic towns. Dutch freight costs were much lower than those of the Hansa, and the Hansa were excluded as middlemen. When Bruges, Antwerp and Holland all became part of the Duchy of Burgundy they actively tried to take over the monopoly of trade from the Hansa, and the staples market from Bruges was transferred to Amsterdam. The Dutch merchants aggressively challenged the Hansa and met with much success. Hanseatic cities in Prussia, Livonia, supported the Dutch against the core cities of the Hansa in northern Germany. After several naval wars between Burgundy and the Hanseatic fleets, Amsterdam gained the position of leading port for Polish and Baltic grain from the late 15th century onwards. The Dutch regarded Amsterdam's grain trade as the mother of all trades (Moedernegotie). Nuremberg in Franconia developed an overland route to sell formerly Hansa-monopolised products from Frankfurt via Nuremberg and Leipzig to Poland and Russia, trading Flemish cloth and French wine in exchange for grain and furs from the east. The Hansa profited from the Nuremberg trade by allowing Nurembergers to settle in Hanseatic towns, which the Franconians exploited by taking over trade with Sweden as well. 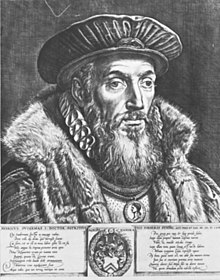 The Nuremberger merchant Albrecht Moldenhauer was influential in developing the trade with Sweden and Norway, and his sons Wolf Moldenhauer and Burghard Moldenhauer established themselves in Bergen and Stockholm, becoming leaders of the local Hanseatic activities. At the start of the 16th century, the league found itself in a weaker position than it had known for many years. The rising Swedish Empire had taken control of much of the Baltic Sea. Denmark had regained control over its own trade, the Kontor in Novgorod had closed, and the Kontor in Bruges had become effectively moribund. The individual cities making up the league had also started to put self-interest before their common Hanseatic interests. Finally, the political authority of the German princes had started to grow, constraining the independence of the merchants and Hanseatic towns. The gigantic warship Adler von Lübeck was constructed for military use against Sweden during the Northern Seven Years' War (1563–70) but was never put to military use, epitomizing the vain attempts of Lübeck to uphold its long-privileged commercial position in a changing economic and political climate. By the late 16th century, the league had imploded and could no longer deal with its own internal struggles. The social and political changes that accompanied the Protestant Reformation included the rise of Dutch and English merchants and the pressure of the Ottoman Empire upon the Holy Roman Empire and its trade routes. Only nine members attended the last formal meeting in 1669 and only three (Lübeck, Hamburg and Bremen) remained as members until its demise in 1862, in the wake of the creation of the German Empire under Kaiser Wilhelm I. Hence, only Lübeck, Hamburg, and Bremen retain the words "Hanseatic City" in their official German titles. Despite its collapse, several cities still maintained the link to the Hanseatic League. Dutch cities including Groningen, Deventer, Kampen, Zutphen and Zwolle, and a number of German cities including Bremen, Demmin, Greifswald, Hamburg, Lübeck, Lüneburg, Rostock, Stade, Stralsund and Wismar still call themselves Hanse cities (their car license plates are prefixed H, e.g. –HB– for "Hansestadt Bremen"). Hamburg and Bremen continue to style themselves officially as "free Hanseatic cities", with Lübeck named "Hanseatic City" (Rostock's football team is named F.C. Hansa Rostock in memory of the city's trading past). For Lübeck in particular, this anachronistic tie to a glorious past remained especially important in the 20th century. In 1937, the Nazi Party removed this privilege through the Greater Hamburg Act possibly because the Senat of Lübeck did not permit Adolf Hitler to speak in Lübeck during his 1932 election campaign. He held the speech in Bad Schwartau, a small village on the outskirts of Lübeck. Subsequently, he referred to Lübeck as "the small city close to Bad Schwartau." The legacy of the Hansa is remembered today in several names: the German airline Lufthansa (i.e., "Air Hansa"); F.C. Hansa Rostock; Hanze University of Applied Sciences, Groningen, Netherlands; Hanze oil production platform, Netherlands; the Hansa Brewery in Bergen and the Hanse Sail in Rostock. DDG Hansa was a major German shipping company from 1881 until its bankruptcy in 1980. Hansabank in the Baltic states has been rebranded into Swedbank). There are two museums in Europe dedicated specifically to the history of the Hanseatic League: the European Hansemuseum in Lübeck and the Hanseatic Museum and Schøtstuene in Bergen. The Tagfahrt or Hansetag was the only central institution of the Hanseatic League. However, with the division into Drittel, the members of the respective subdivisions frequently held a Dritteltage ("Drittel meeting") to work out common positions which could then be presented at a Tagfahrt. On a more local level, league members also met, and while such regional meetings were never formalized into a Hanseatic institution, they gradually gained importance in the process of preparing and implementing Tagfahrt decisions. This division was however not adopted by the Kontore, who, for their purposes (like Ältermänner elections), grouped the league members in different ways (e.g., the division adopted by the Stahlhof in London in 1554 grouped the league members into Dritteln, whereby Lübeck merchants represented the Wendish, Pomeranian Saxon and several Westphalian towns, Cologne merchants represented the Cleves, Mark, Berg and Dutch towns, while Danzig merchants represented the Prussian and Livonian towns). In 1980, former Hanseatic League members established a "new Hanse" in Zwolle. This league is open to all former Hanseatic League members and cities that share a Hanseatic Heritage. In 2012 the New Hanseatic league had 187 members. This includes twelve Russian cities, most notably Novgorod, which was a major Russian trade partner of the Hansa in the Middle Ages. The "new Hanse" fosters and develops business links, tourism and cultural exchange. In 2006 King's Lynn became the first English member of the newly formed new Hanseatic League. It was joined by Hull in 2012 and Boston in 2016. The so-called New Hanseatic League was established in February 2018 by finance ministers from Denmark, Estonia, Finland, Ireland, Latvia, Lithuania, the Netherlands and Sweden through the signing of a two-page foundational document which set out the countries' "shared views and values in the discussion on the architecture of the EMU." ^ Cordes, Gerhard; Möhn, Dieter (1983). Handbuch zur niederdeutschen Sprach- und Literaturwissenschaft. Erich Schmidt Verlag. p. 119. ISBN 3-503-01645-7. ^ "Synonym-Details zu 'Deutsche Hanse · Düdesche Hanse · Hansa Teutonica (lat.)". openthesaurus. Retrieved 9 June 2018. ^ "Hansa - Hanse". Lexikus. Retrieved 9 June 2018. ^ "Hanse". Planet Wissen. Retrieved 9 June 2018. ^ Hansen, Mogens Herman (2000). A comparative study of thirty city-state cultures: an investigation. Royal Danish Academy of Sciences & Letters: Copenhagen Polis Centre (Historisk-filosofiske Skrifter 21). p. 305. ^ "The Cronicle of the Hanseatic League". Archived from the original on 7 March 2012. Retrieved 10 December 2011. ^ Translation of the grant of privileges to merchants in 1229: "Medieval Sourcebook: Privileges Granted to German Merchants at Novgorod, 1229". Fordham.edu. Retrieved 20 July 2009. ^ Atatüre, Süha (2008). "The Historical Roots of European Union: Integration, Characteristics, and Responsibilities for the 21st Century" (PDF). European Journal of Social Sciences. Eurojournal. 7 (2). Archived from the original (PDF) on 19 February 2009. Retrieved 26 July 2009. ^ "Ancient Rus: trade and crafts :: History of Russian trade and crafts :: Business & Law :: Russia-InfoCentre". www.russia-ic.com. Retrieved 20 March 2019. ^ Braudel, Fernand (17 January 2002). The Perspective of the World. Volume 3: Civilization and Capitalism, 15th–18th century. Phoenix Press. ISBN 1-84212-289-4. ^ a b Frederick Engels "The Peasant War in Germany" contained in the Collected Works of Karl Marx and Frederick Engels: Volume 10 (International Publishers: New York, 1978) p. 400. ^ Pulsiano, Phillip; Kirsten Wolf (1993). Medieval Scandinavia: An Encyclopedia. Taylor & Francis. p. 265. ISBN 0-8240-4787-7. ^ Stearns, Peter N; William Leonard Langer (2001). The Encyclopedia of World History: Ancient, Medieval, and Modern, Chronologically Arranged. Houghton Mifflin Harcourt. p. 265. ISBN 0-395-65237-5. ^ MacKay, Angus; David Ditchburn (1997). Atlas of Medieval Europe. Routledge. p. 171. ISBN 0-415-01923-0. ^ a b Dollinger, Philippe (2000). The German Hansa. Routledge. pp. 341–43. ISBN 978-0-415-19073-2. Retrieved 30 April 2011. ^ Meier, Dirk (2009). Seafarers, Merchants and Pirates in the Middle ages. Boyden Press. ISBN 978-1-84383-5-127. , 145. ^ a b Blumówna, Helena. Kraków jego dzieje i sztuka: Praca zbiorowa [Krakow's history and art: Collective work]. Katowice: 1966. p. 93. ^ Davies, Norman (1982). God's playground. A history of Poland, Volume 1: The Origins to 1795. Oxford University Press. ISBN 978-0-19-925339-5. ^ "Agreement of the Hanseatic League at Lübeck, 1557". Baltic Connections. Retrieved 5 May 2009. ^ "Guide to Lübeck". Europe à la Carte. Retrieved 20 July 2009. ^ "Travel to the Baltic Hansa". Europa Russia. ^ a b c Hammel-Kiesow, Rolf (2008). Die Hanse (in German). Beck. ISBN 3-406-58352-0. ^ Northrup, Cynthia Clark, ed. (2015) . "Hanseatic Leage". Encyclopedia of World Trade: From Ancient Times to the Present. 2 (Reprint ed.). London: Routledge. p. 444. ISBN 9781317471530. Retrieved 19 February 2018. To facilitate trade in foreign countries, the Hansa established counters (Kontore) [...]. [...] The counters operated as the equivalent of an early stock exchange. ^ a b Pfeiffer, Hermannus (2009). Seemacht Deutschland. Die Hanse, Kaiser Wilhelm II. und der neue Maritime Komplex (in German). Ch. Links Verlag. p. 55. ISBN 3-86153-513-0. ^ a b c d e f g h i j k l m n o p q r s Mills, Jennifer (May 1998). "The Hanseatic League in the Eastern Baltic". Encyclopedia of Baltic History (group research project) . University of Washington. ^ a b c d e f g h i j k l m n o p q r s t u v w x y z aa ab ac ad ae af ag ah ai aj ak al am an ao ap aq ar as at au av aw Falke, Dr Johannes (1863). Die Hansa als deutsche See- und Handelsmacht [The Hansa as a German maritime and trading power]. Berlin: F Henschel. pp. 62–64. ^ Distler, Eva-Marie (2006). Städtebünde im deutschen Spätmittelalter. Eine rechtshistorische Untersuchung zu Begriff, Verfassung und Funktion (in German). Vittorio Klostermann. pp. 55–57. ISBN 3-465-04001-5. ^ Fritze, Konrad; et al. (1985). Die Geschichte der Hanse (in German). p. 217. ^ a b c d e f g h i j k l m n o p q r Natkiel, Richard (1989). Atlas of Maritime History. Smithmark Publishing. p. 33. ISBN 0-8317-0485-3. ^ Reibstein, Ernst. "Das Völkerrecht der deutschen Hanse" (PDF) (in German). Max-Planck-Institut für ausländisches öffentliches Recht und Völkerrecht. pp. 56–57 (print), pp. 19–20 in pdf numbering. Retrieved 30 April 2010. ^ a b c d e f g h i j k l m n o p q r s t u v w x y z aa ab ac ad ae af ag ah ai aj ak al am an ao ap aq ar as at au av aw ax ay az ba bb Jotischky, Andrew; Caroline Hull (2005). The Penguin Historical Atlas of the Medieval World. Penguin Books. pp. 122–23. ISBN 978-0-14-101449-4. ^ a b c d e f g h i j k l m n o p q r Holborn, Hajo (1982). A History of Modern Germany: The Reformation. Princeton University Press. pp. 32, 74, 80–82. ISBN 0-691-00795-0. ^ a b c d e f g h i j k l m n o p q r s t u v w x y z aa ab ac ad ae af ag ah ai aj ak al am an ao ap aq ar as at au av aw ax ay az ba bb bc bd be bf bg Dollinger, Philippe (2000). The German Hansa. Stanford University Press. pp. ix–x. ISBN 0-8047-0742-1. Retrieved 15 May 2011. ^ a b c d e f g h i j k l m n o p q r s t u v w x y z aa ab ac ad ae af ag ah Barthold, Dr Friedrich Wilhelm (1862). Geschichte der Deutschen Hanse [History of the German Hansa]. Leizig: TD Weigel. pp. 35 and 496–97. ^ a b c d e f g h i j k l m n o p q r s t u v w x y z aa ab ac ad ae af ag ah ai aj ak al am Schäfer, D (2010). Die deutsche Hanse [The German Hanseatic League]. Reprint-Verlag-Leipzig. pp. 37. ISBN 978-3-8262-1933-7. ^ a b c d e f g Wernicke, Horst (2007). "Die Hansestädte an der Oder". In Schlögel, Karl; Halicka, Beata (eds.). Oder-Odra. Blicke auf einen europäischen Strom (in German). Lang. pp. 137–48, here p. 142. ISBN 3-631-56149-0. ^ a b c d e f g h i j k l m n Mehler, Natascha (2009). "The Perception and Interpretation of Hanseatic Material Culture in the North Atlantic: Problems and Suggestions" (PDF). Journal of the North Atlantic (Special Volume 1: Archaeologies of the Early Modern North Atlantic): 89–108. Archived from the original (PDF) on 24 July 2011. ^ "Stralsund". Encyclopædia Britannica. 2011. Retrieved 28 December 2011. ^ a b c d e f Buchholz, Werner; et al. (1999). Pommern (in German). Siedler. p. 120. ISBN 3-88680-272-8. ^ "Varför ruinerades Visby" [Why is Visby ruined]. Goteinfo.com (in Swedish). Retrieved 30 April 2011. ^ Westholm, Gun. Hanseatic Sites, Routes and Monuments: A Traveler's Guide to the Past and Present. Uppsala: Gotland Centre for Baltic Studies, 1994. ^ a b c d Bedford, Neil (2008). Poland. Lonely Planet. pp. 403, 436, 452 and 476. ISBN 978-1-74104-479-9. ^ "Alma Mater" (109). Kraków: Jagiellonian University. 2008: 6. ^ Carter, Francis W. (1994). Trade and urban development in Poland. An economic geography of Cracow, from its origins to 1795, Volume 20. Cambridge studies in historical geography. Cambridge University Press. pp. 70–71, 100–02. ISBN 0-521-41239-0. ^ Gilewska-Dubis, Janina (2000). Życie codzienne mieszczan wrocławskich w dobie średniowiecza [Everyday life of citizens of Wrocław during medieval times]. Wydawnictwo Dolnośląskie. p. 160. ^ Buśko, Cezary; Włodzimierz Suleja; Teresa Kulak (2001). Historia Wrocławia: Od pradziejów do końca czasów habsburskich [Wrocław History: From Prehistory to the end of the Habsburg era]. Wydawnictwo Dolnośląskie. p. 152. ^ a b Turnbull, Stephen R (2004). Crusader castles of the Teutonic Knights: The stone castles of Latvia and Estonia 1185–1560. Osprey Publishing. pp. 20, 60. ISBN 978-1-84176-712-3. ^ a b c d e f g h i j k l m n o p q r s t u v w x y z aa ab ac ad ae af ag Mehler, Natascha (2011). "Hansefahrer im hohen Norden" (PDF). epoc (2): 16–25, particularly 20 and 21. Archived from the original (PDF) on 24 July 2011. ^ a b c d e f g h ver Berkmoes, Ryan; Karla Zimmerman (2010). The Netherlands. Lonely Planet. p. 255. ISBN 978-1-74104-925-1. ^ a b c d e f g h i j McDonald, George (2009). Frommer's Belgium, Holland & Luxembourg, 11th Edition. Frommers. pp. 134, 176, 397, 432–38. ISBN 978-0-470-38227-1. ^ a b This article incorporates text from a publication now in the public domain: Chisholm, Hugh, ed. (1911). "Hanseatic League" . Encyclopædia Britannica (11th ed.). Cambridge University Press. ^ a b c d e Mehler, Natascha (April 2009). 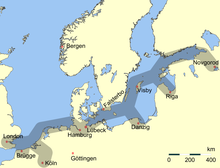 "HANSA: The Hanseatic Expansion in the North Atlantic". University of Vienna. Archived from the original on 27 July 2014. Retrieved 15 May 2011. ^ a b c d Ward, Adolphus William. Collected Papers Historical, Literary, Travel and Miscellaneous. pp. 95, 391. ^ Conybeare, John (1985). "Trade Wars: A Comparative Study of Anglo-Hanse, Franco-Italian, and Hawley-Smoot Conflicts". World Politics. 38 (1): 147–172. doi:10.2307/2010354. JSTOR 2010354. ^ Mitchell, Alex. "The Old Burghs Of Aberdeen". Aberdeen Civic Society. Archived from the original on 12 August 2011. Retrieved 1 May 2011. ^ Merriam-Webster, Inc (1997). Merriam-Webster's geographical dictionary. Merriam-Webster, Inc. pp. 74–75. ISBN 978-0-87779-546-9. ^ Miruß, Alexander (1838). Das See-Recht und die Fluß-Schifffahrt nach den Preußischen Gesetzen. Leipzig: JC Hinrichsschen Buchhandlung. p. 17. Retrieved 2 May 2011. ^ "Göttingen". Encyclopædia Brittanica. Retrieved 2 May 2011. ^ Gardiner, Mark; Natascha Mehler (2010). "The Hanseatic trading site at Gunnister Voe, Shetland" (PDF). Post-Medieval Archaeology. 44 (2): 347–49. Archived from the original (PDF) on 24 July 2011. ^ Wild, Albert (1862). Die Niederlande: ihre Vergangenheit und Gegenwart, Volume 2 [The Netherlands: its past and present, Volume 2]. Wigand. pp. 250. ^ Dollinger, Philippe (2000). The German Hansa. Routledge. pp. 128, 352. ISBN 978-0-415-19073-2. ^ "History of Koknese". Koknese official website. 10 January 2011. Retrieved 15 May 2011. ^ "Collector Coin Koknese". National Bank of Latvia. Archived from the original on 26 September 2011. Retrieved 15 May 2011. ^ Könnecke, Jochen; Vladislav Rubzov (2005). Lettland [Lithuania]. DuMont Reiseverlag. pp. 23, 26–7, 161. ISBN 978-3-7701-6386-1. ^ Mehler, Natascha (October 2010). "The Operation of International Trade in Iceland and Shetland (c. 1400–1700)". University of Vienna. Archived from the original on 24 July 2011. Retrieved 15 May 2011. ^ Pohle, Jürgen (December 2010). "O estabelecimento dos mercadores-banqueiros alemães em Lisboa no início do século XVI" (PDF). Universidade Atlântica (Lisbon). Archived from the original (PDF) on 13 January 2016. Retrieved 28 December 2015. ^ a b "City League The HANSE". Archived from the original on 17 August 2010. ^ "King's Lynn Hanse Festival 2009". Borough Council of King's Lynn and West Norfolk. Archived from the original on 13 May 2010. Retrieved 23 August 2010. ^ Paul Richards (introduction) Six Essays in Hanseatic History 128 pages, plates and maps, Poppyland Publishing, Cromer, 2017. ISBN 9781909796331. Dollinger, P (2000). The German Hansa. Routledge. pp. 341–43. ISBN 978-0-415-19073-2. Gade, John A. (1951). The Hanseatic Control of Norwegian Commerce During the Middle Ages. E.J. Brill. Halliday, Stephen. "The First Common Market?" History Today 59 (2009): 31–37. Israel, I. Jonathan (1995). The Dutch Republic: It’s Rise, Greatness and Fall, 1477–1806. Oxford University Press. Nash, Elizabeth Gee (1929). The Hansa: Its History and Romance. ISBN 1-56619-867-4. Nedkvinte, Arnved (2013). The German Hansa and Bergen 1100–1600. Böhlau Verlag. ISBN 9783412216825. Wubs-Mrozewicz, Justyna, and Stuart Jenks, eds. The Hanse in Medieval and Early Modern Europe (Leiden: Koninklijke Brill NV, 2013). Harrison, Gordon. "The Hanseatic League in Historical Interpretation." The Historian 33 (1971): 385–97. doi:10.1111/j.1540-6563.1971.tb01514.x. This page was last edited on 3 April 2019, at 02:56 (UTC).